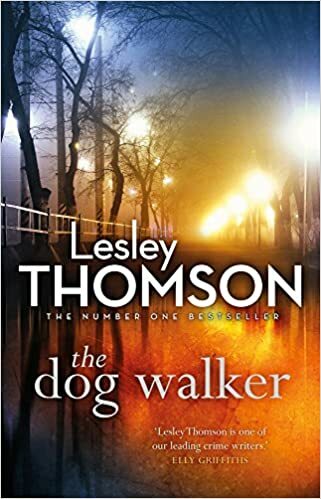 The Dog Walker is the fifth in Lesley Thomson’s series featuring Stella Darnell, The Detective’s Daughter. I have read the first two and somehow missed the next two but had no problem following this story. So don’t worry if you haven’t even read any (though I would recommend it), you can easily read this as a stand-alone. Stella is quite an unusual detective in that she actually runs a cleaning agency, Clean Slate, and does her detecting as a bit of a side line. In this book, she is approached by the husband of Helen Honeysett, a jogger who disappeared almost thirty years ago, and asked to investigate just what happened to his wife. Her assistant, Jack Harmon, is tasked with cleaning one of the cottages in the same row of houses in preparation for selling and the two begin investigating the past and present residents of Thames Cottages in a bid to uncover the past. That very atmospheric cover is reflected in the story and I liked the way the author built up the tension slowly over the story. It was a book which intrigued from the outset as we read about the jogger out for a run and a dog walker meeting someone on the canal towpath and saying ‘oh it’s you’. Immediately this made me think that, in common with many murder victims, Helen knew her murderer. Stella obviously has the same thoughts and soon discovers that many of the residents may have something to hide. The eerie atmosphere is satisfyingly created, particularly with the towpath which has mists swirling around its dark and muddy paths. There was also a creepy atmosphere in the house Jack is cleaning, with hints of supernatural goings-on. One character who stands out for me in this novel is young Megan. Megan was just seven when her neighbour Helen disappeared, a traumatic enough event for a young child to have to deal with. She is subsequently questioned by the police and something she says sets off a tragic set of events. Megan is full of confusion and guilt and I felt so sorry for her and the isolation she felt after her fellow schoolmates were so cruel to her. It is through Megan that we get a glimpse of what was going on in the immediate aftermath of Helen’s disappearance and her childish, innocent view reveals much about the residents of Thames Cottages. The story alternates between the past and the present and the reader uncovers just a little more of what is going on as Stella and Jack continue to work away with what seems little to go on. As the stories from past and present inevitably converge, you will find yourself reading that little bit quicker, keen to know just what happened to Helen all these years ago and just who was responsible. I also wanted to find out how life had worked out for Megan as I had really taken her to my heart. The Dog Walker is a very intriguing mystery story, intelligently plotted and with plenty to surprise the reader. Stella and Jack must reawaken the secrets of the past in order to solve the mysteries of the present. January, 1987. In the depths of winter, only joggers and dog walkers brave the Thames towpath after dark. Helen Honeysett, a young newlywed, sets off for an evening run from her riverside cottage and disappears. Twenty-nine years later, Helen’s body has never been found. Her husband has asked Stella Darnell, a private detective, and her side-kick Jack Harmon, to find out what happened all those years ago. But when the five households on that desolate stretch of towpath refuse to give up their secrets, Stella and Jack find themselves hunting a killer whose trail has long gone cold.